Being active helps to increase the good cholesterol (HDL) in your blood. It stimulates the movement of fatty deposits to the liver, which helps to keep the heart and blood vessels in good condition. 150 minutes of moderate-intensity exercise per week is all you need (30 minutes, 5 days per week). High in fibre and a source of protein, one serving of Beta heart also provides 1.5g beta-glucans; a soluble fibre found in the oat bran from oats, which helps to lower or maintain your cholesterol. 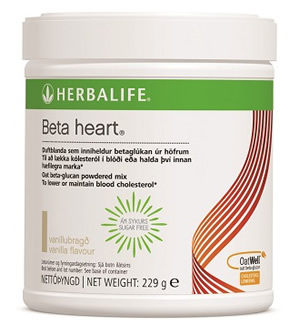 Add 1 or 2 scoops of Beta heart powder to a glass of water or fruit juice, or mix it with your favourite Formula 1 shake to create a healthy breakfast, lunch or dinner.